One of my favorite Italian dishes is pasta with a warm tomato cream sauce. Tomatoes make the sauce chunky and the cream helps it stick to the pasta noodles to get you all the goodness in each bite. I love it even more if there is just a hint of spiciness to it to give it a zing. Penne Alla Vodka is a popular pasta dish on many American Italian restaurant menus. It combines the tomato cream idea I talked about above and adds in the unique flavor of vodka and crushed red pepper. Since I’ve made pico di gallo with tequila and use wine frequently in dishes like Brazilian fish stew, I decided to go with a drunken pasta recipe to stay with the theme. 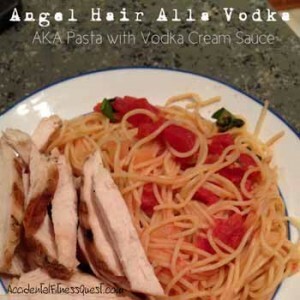 Instead of penne, I went with angel hair noodles to create the Angel Hair Alla Vodka since that’s what I had in the house. I’m all about speed when it comes to dinner and angel hair noodles cook a few minutes faster than penne. If you are serving this to kids and are worried about using vodka, you can substitute more chicken broth instead of the vodka. Bring a pot to boil and cook pasta according to package directions. Heat a skillet over medium heat and spray with non-stick spray. Saute the onion for about 5 minutes until softened. Add the garlic and red pepper, and cook for another minute. Pour in the vodka and bring to a boil. Simmer for about 5 minutes and then add the broth and tomatoes. Cook for another 5 minutes or so until some of the liquid evaporates. Remove from heat and stir in the soy milk. When the pasta is done, drain well and return to the pot you cooked it in. Pour the tomato sauce over top and toss to combine. Top with the fresh basil. Makes 4 servings at approximately 300 calories each – 9g protein, 48g carbs, and 9g fat. Since the sauce simmers for a while and most of the alcohol burns off in the process, I wasn’t sure how to count the calories. Since I lack a lab to test the pasta sauce, the nutritional information above includes the full values from the vodka and is probably on the high side given evaporation. You may scream in horror at the thought of using vanilla soy milk in a pasta recipe but there’s a method to my madness. I can’t use cream because of The Kid’s dairy allergy. If you’ve ever tasted real cream, it has a bit of sweetness to its flavor. I opted for vanilla soy milk to mimic that taste. If you want the more traditional version, use penne pasta instead of the angel hair. You can also use spaghetti, linguine or any other noodle your heart desires. Even a combination of zoodles and noodles would work well. The pasta turned out perfectly and wasn’t too plain nor too saucy. I topped mine with grilled chicken to round out the meal and a green salad on the side. If you want to try a different sauce for your pasta, I also like a roasted tomato sauce with meat and a vegetarian roasted tomato sauce. If you’re interested in working with me towards your health goals, I’d love to chat. You don’t have to and shouldn’t 100% give up foods you love. Drop me an email, or come on over to Facebook and ask a question.